The last two data items in my weekly training reports are calories expended and average weight. These are two data points that I have started watching closely as my training for the 2014 season resumed on October 8, 2013. I expect to start burning a lot more calories as my workouts increase in length and intensity, and, consequently, I expect my weight to start dropping by roughly half a pound (1,750 C) per week. Each off-season (October through March), my weight has invariably increased, with a gradual weight loss at the start of the race season (March through May). Then, my weight starts to increase again. Even exercising portion control did little to stem the weight increase during the 2013 race season. It is tied to the switch from aerobic endurance training to high-intensity sprint workouts. I started cooking with fresh, whole, and organic (if available) ingredients, rather than eating packaged foods, like frozen meals. The recipes that I’ve already prepared have required simple ingredients, were easy to follow, were very flavorful, and were devoid of empty calories. I have even started fixing “portables,” the authors’ substitute for pre-packaged energy bars. These include rice cakes, baked eggs, two-bite pies, baked cakes, cookies, griddle cakes, pancakes, and a variety of other nutritious, homemade, fresh, bite-size snacks. The charts below show my average monthly weight since September 2013. 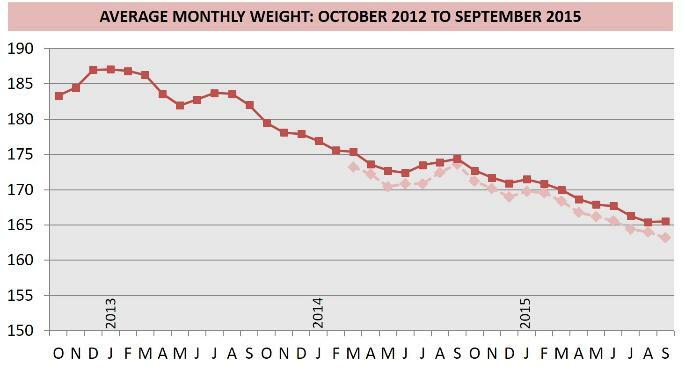 The second lighter colored line, that starts in March 2014, shows the lowest daily weight I attained each month. My ideal race weight is 149 pounds, which I will work to achieve in 2019. NOTE: The dramatic weight loss in May-June 2016 was due to a bout of pneumonia immediately after successful gall bladder removal surgery on April 20, 2016. The equally dramatic weight gain in August-October 2016 was due to the recovery from pneumonia, the focus on anaerobic power workouts during the second half of the season, and a second hernia surgery on October 5, followed by four weeks off the bike, rather than the usual two weeks recovery at the end of the season. I’ve never acquired a taste for coffee or alcoholic beverages, so they are easy to avoid. I’ve avoided caffeinated beverages for many years now. But, I’ve now added pre-packaged fruit juices to that list, along with packaged meals, like frozen entrees. I no longer eat fast food or at sit-down restaurants. In 2013, I developed an intolerance for gluten and peanuts, so I avoid wheat and peanut products. I drink filtered water, almond milk, and fruit juices, like cranberry juice. I eat gluten-free pasta products. I make my own granola with old fashioned rolled oats, agave juice, slivered almonds, and dried fruit. I make “portables” with calrose (“sticky”) rice and a variety of ingredients, like ham and cheese. Lunches and dinners seldom take more than 30 minutes to prepare, and I make enough for leftovers. I’ve shifted my meat preferences from beef to chicken and fish. WHAT’S SO IMPORTANT ABOUT DIET? All of this effort to “eat healthy” is driven by the fact that competitive endurance athletes, whether professional or amateur, are constantly aware of their power-to-weight ratio. I’ve discovered that I gain a half mile per hour of maintainable speed for every six pounds I lose. Sensible weight loss is a combination of exercise and eating fewer calories, without losing muscle mass or compromising my health. The only answer is a diet of fresh, whole, organic, and homemade foods.